The manufacturers pack "extra" equipment with the raft in a number of ways. The most obvious distinction being that some end up in the water upon inflation, others are kept inside the raft. Given a choice, I prefer that the SEP be in the raft upon inflation, not in the water. Unfortunately, that is not always the case and with reversible rafts, simply not possible. Air Cruisers, EAM, Survival Products and Hoover all put the SEP in the water. With the RFD "R" series raft, it just depends upon which side ends up. If the SEP is not in the raft it must be retrieved from the water. EAM, Survival Products and Hoover add a separate pack which snaps or Velcros to the main raft valise. This enables them to easily change the kits from one type to another or add one to a raft with no kit. The add-on style has a few drawbacks we noted. One, it ends up in the water at the end of a tether and must be retrieved by the survivors, who may not even realize it is there. Since it is not at all waterproof, the contents are exposed to the water and are entirely dependent upon their own packaging to stay dry. All the add-on kits allowed their contents to get wet. This had detrimental effects on a number of items which weren't waterproof or adequately packaged. Even where an attempt was made to package items in plastic zip-lock bags, the thin bags used had developed holes from rubbing on the contents and they leaked. We also found that both the EAM and Hoover kits opened up somewhat when the raft was deployed. Both lost critical items before we noticed what was happening and retrieved the kits from the pool. In the short time between deployment and retrieval the Hoover lost the flashlight and four canopy support rods! We were looking for the problem with the EAM but it still lost the flashlight and other items were working their way out of the pack as we grabbed it. No doubt much more would have been lost if we hadn't acted quickly and there wasn't even any wave motion to contend with. We were able to retrieve the articles from the bottom of the pool. In the real world survivors wouldn't have been quite so lucky. We consider this a critical failing. The Survival Products kit with its Velcro closure system on all sides remained secure. All these rafts note the location of the SEP via a stenciled placard on the tube. Even the most conspicuous of these is easily missed in a full raft. While Air Cruisers stencils the instructions "SURVIVAL EQUIPMENT PULL IN IMMEDIATELY" with a arrow on top of the upper tube in the 13-person raft, the canopy covers most of it so it cannot be seen. On the 4-person there is simply "SURVIVAL KIT with an arrow on the side of the tube. Perhaps it isn't as important to pull this one in immediately? On the RFD "R" series raft, the location of the SEP is noted with a large placard, black on white, but there are more than a few lines near that point so it can still be a bit confusing. RFD uses a semi-transparent plastic drawstring bag to hold the survival equipment. On the "R" series rafts there are at least two bags, one with supplies and equipment, the other with hand paddles, heaving line and manual inflation pump. The ability to see inside the bag, even if not perfectly, is especially important since there is nowhere else on the raft to store equipment or supplies. The drawstring top is a pain to deal with, especially since it must be open and closed again and again as there is no other storage. The long box-shaped Air Cruisers SEP is made of PCF with heavy metal snaps to keep the top closed. An inner clear plastic bag, sealed closed with mil-spec duct tape, holds all the contents, but water still got in. Some water resistant items are loose inside this larger bag, along with the shrink-wrapped PUR-06 watermaker, but there are also two other modules vacuum packed in heavy plastic. Despite finger holes and a slit in the plastic, opening proved difficult for one of these vacuum packed modules on the 13-person raft. BFGoodrich secures two bags inside the raft on short tethers. 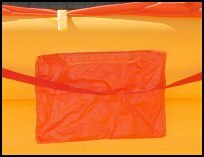 The bags are made of orange canopy material with all manner of yellow Velcro strips attached which are used to fold the bags closed into compact bundles. With all that Velcro and no apparent system, opening the bags was somewhat frustrating. Inside the cloth bags are four heavy duty zipper lock plastic bags containing survival equipment modules for signaling, raft maintenance, first aid and food. A shrink-wrapped PUR-06 watermaker is also included. Winslow fabricates SEP bags out of bright yellow PCF, envelope style, with a 2 inch Velcro seal on the top flap. This makes it easy to get stuff in and out, but still very secure. On the top face of the bag is an orange placard with black printing SURVIVAL EQUIPMENT" with instructions to put the contents in the storage bags. The bag is equipped with a pair of loops at the sides which are used to tie it down to the raft's floor. Size of the bag is adjusted for the size of the SEP. Two bags are used on larger rafts. A bright orange placard says "SURVIVAL EQUIPMENT" and directs the survivors to "PLACE CONTENTS IN INDIVIDUAL POCKETS ATTACHED TO LIFE RAFT." Great idea, except not all Winslow rafts come with storage pockets. They might consider alternate language for those rafts. Inside the SEP, most items are vacuum packed in lightweight plastic. This plastic is too lightweight and about half the packages had lost vacuum. Because the equipment is inside the raft this is less of a problem, none of it got wet, but industrial grade packaging material would be a far better choice. Each bag had a slit cut in it and tape tabs made it pretty easy to open. In addition, on each side was a bright yellow placard suggesting use of the raft knife to open the bags, which was even easier. You wouldn't expect a raft to come with a storage locker, but some rafts provide far better means to store supplies and equipment than just the bag they came in. The problem with the bag they came in is that it must lay on the floor in the way and every time you need something you end up having to at least partially empty the bag, each time risking loss of the items. If you need something quickly, like flares to signal a passing aircraft, it can get pretty wild. Having some means to organize and store equipment and supplies is a big advantage. EAM, Survival Products, Hoover and RFD provide no storage capability on their rafts beyond the SEP bag. Winslow, the first to offer any storage bags, continues to provide five large bags (12 x 12 x 2 inches) on the Ultima. 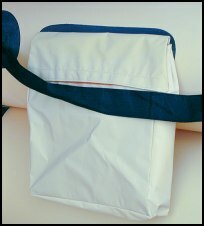 These bags are constructed of raft material and have a full length 2 inch Velcro seal along the top flap. The bags are of box construction and sufficiently large and numerous to hold anything in the SEP as well as additional supplies and equipment that might have been brought on board by survivors or salvaged from the water. The full length Velcro seal makes it unlikely any but the very smallest items would come out in the event of an overturning (such small items should be kept inside bigger zipper style plastic bags). The Ultra-Light has similar bags made of lighter weight material. These bags are 13.5 x 7 x 2.5 inches with a flap secured by 1-inch Velcro. Three similar sized bags constructed of buoyancy tube material and with the 2-ich Velcro flaps are available as an option on the Island Flyer ($????). While Winslow calls them "dry" bags, they are not sealed completely. However, they do get supplies and equipment up off the floor of the raft and keep them much drier than they would otherwise be. If the top flap was gussetted such that it completely enclosed the top when down, that would be a more accurate statement. Given the general weather resistance of Winslow's canopied rafts, that is not a serious consideration in those rafts. However, if optionally installed on an raft without a canopy, a gussetted top flap would be a definite advantage as they are completely exposed to the elements, sea spray and the like. BFG installs two 9 x 14 inches envelope construction bags of lightweight canopy material. There is a short strip of 1-inch Velcro on the flap closure, but there is a huge gap at either end that would allow contents to escape. Simply extending the Velcro all the way across would improve security. While they obviously don't have the total storage capacity of the Winslow bags, in fact they just barely held the contents of the larger raft's SEP, they are far better than nothing. Air Cruisers provides two storage bags on the 4-person raft, 3 larger bags on the 13-person. 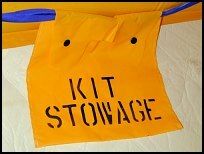 The are stenciled with "KIT STOWAGE" on the smaller raft, a stencil on the tube, "SURVIVAL KIT STORAGE," identifies them on the 13-person raft. They are of made of PCF material and are of envelope construction, 12 x 11 inches and 23 x 11.5 inches, respectively. The flap is secured with two and four metal snaps, respectively. This flap also serves to attach the bags to the interior grab lines. To say this arrangement was not highly regarded would be an understatement. Wrote one volunteer, "to call this Mickey Mouse would be an insult to the mouse."